Sister chromatids are two identical copies of the same chromosome formed by DNA replication, attached to each other by a structure called the centromere. During cell division, they are separated from each other, and each daughter cell receives one copy of the chromosome. Diploid organisms have two copies of every chromosome, one received from each parent through their gametes. 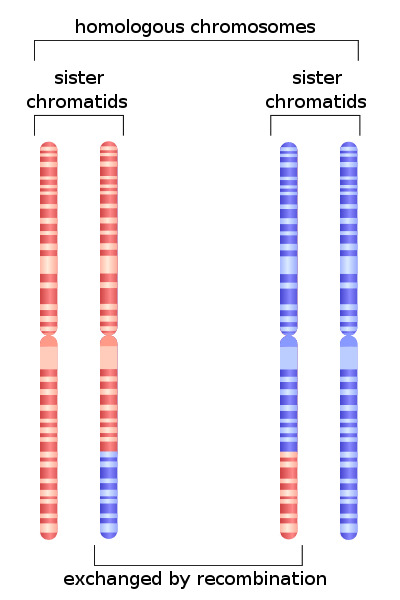 These pairs are called homologous chromosomes and carry information for the same genes, but they are not exactly identical in their DNA sequence. This system is preferred among organisms that reproduce sexually because it makes the population varied and genetically robust. For instance, some communities have a high incidence of a variant of the hemoglobin gene that gives rise to sickle cell anemia.When a person has this variant in both their homologous chromosomes, they develop the illness and suffer from a number of complications. However, people with only one homologous chromosome carrying this gene variant are protected from severe malarial infection. The presence of two variants of the hemoglobin gene in a single person allows them to adapt to the presence of lethal malarial parasites, without succumbing to sickle cell anemia. Occasionally, homologous chromosomes are also used to repair mutations, especially when both the strands of a DNA molecule are broken. During the synthesis or ‘S’ phase of the cell cycle, all the DNA in the cell is duplicated, so each chromosome now has an exact copy, in addition to having a homologous pair. During mitosis, DNA condenses to form visible chromosomes, and these two identical copies, or sister chromatids, are attached to each other and form an ‘X’ shape. While sister chromatids are exact copies of each other, non-sister chromatids come from homologous chromosomes. They code for the same genes, but are not genetically identical. 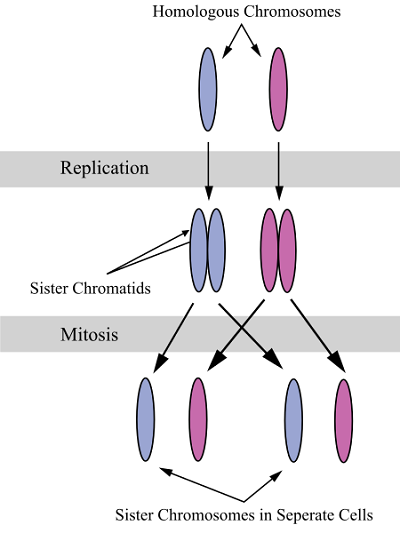 Occasionally, genetic material is exchanged between non-sister chromatids during meiosis, allowing for new arrangements of genes to be passed to the progeny. This is called crossing over or recombination. During meiotic metaphase I, homologous chromosomes are aligned with each other along the equator of the cell and in anaphase I, they separate and the two members of the pair move to opposite poles. DNA duplication during S phase of the cell cycle allows cells to maintain their genetic content across generations. The primary function of sister chromatids is to pass on a complete set of chromosomes to all the daughter cells formed as a result of cell division. During mitosis, they are attached to each other through the centromere – a stretch of DNA that forms protein complexes. By the end of mitosis, a series of reactions separate the two sister chromatids, moving them towards opposite ends of the dividing cell, and a new cell membrane forms between them, creating two daughter cells. Both the cells are genetically identical to the parent cell. In addition to this basic function, sister chromatids play an important role in maintaining the integrity of the genome by being involved in DNA repair. They are usually spatially close to each other, compared to the homologous chromosome pair. Therefore this form of proofreading is preferred in the G2 phase of the cell cycle, after chromosome duplication has occurred. When both the strands of a DNA molecule are broken, it is not possible to repair the DNA using base pairing, and so many organisms seem to use this proximal chromatid to repair the break. This was initially discovered as Sister Chromatid Exchange (SCE) and later was found to be even more effective at DNA repair than methods using the homologous pair. However, extremely high rates of SCE (between 15 and 100 for each pair of chromatids), are indicative of illness and have been associated with some inherited forms of cancer such as Bloom’s syndrome. Sister chromatids are attached to each other from the time DNA is duplicated till anaphase, through the action of proteins called cohesins. Initially, cohesins are present along the entire length of the chromosome, especially around heterochromatin regions. Therefore, at prophase, sister chromatids are stuck to each other along their entire length. However, by the time they are aligned on the metaphase plate, cohesins are seen only along a short region of the DNA consisting of the centromere. Centromeric heterochromatin can be formed by a number of methods depending on the organism. Yeast cells use RNA interference, while roundworms and some insects allow the formation of a diffuse structure along the entire chromosome. Humans have a special histone called CENP that influences the formation of the centromere and the recruitment of specific proteins. Attachment of the chromosomes to the spindle is mediated by a protein complex called the kinetochore. Kinetochores are made of several layers, with the deepest layer interacting with CENP histones. The outer layer of the kinetochore is formed towards the end of prophase and is made of proteins containing anchoring sites for microtubules. The outermost domain contains a dynamic arrangement of proteins that are involved in mitotic checkpoints and regulators of chromosome behavior. The two kinetochores of sister chromatids face opposing directions allowing the chromosomes to attach to microtubules emanating from different poles. A microtubule emanating from one pole of the cell undergoes rapid periods of growth and shrinking when it appears to be ‘searching’ for a kinetochore. Once it is attached to the kinetochore, the microtubule is stabilized and this attachment seems to influence the other sister chromatid to expose its kinetochore towards the opposite pole. When they are attached to microtubules emanating from opposite poles, the action of the microtubules opposes the adhesive property of cohesins, generating a sort of tension along the centromere. This tension is recognized by the spindle assembly checkpoint and once all the chromosomes are aligned on the metaphase plate of cell, with appropriate assembly and attachment of the mitotic spindle, the cell progresses into anaphase. During the congression of chromosomes at the metaphase plate, when some kinetochores are unattached to the spindle, an active signal inhibits the onset of anaphase. This involves the Mitotic Checkpoint Complex or the MCC. The MCC contains proteins that primarily inhibit the activity of the Anaphase Promoting Complex (APC). The primary role of the APC is to attach a small regulatory polypeptide called ubiquitin to its target protein. When a protein is tagged with a chain of ubiquitin molecules, it is seen as a signal for the protein to be degraded by the proteasome. During the metaphase to anaphase transition, APC targets securin and tags it for degradation by the proteasome. The absence of securin allows another enzyme called separase to act on cohesin molecules holding the two chromatids together. When cohesins are no longer resisting the pull of microtubules in the spindle, sister chromatids separate and move towards opposite poles. Cell membrane invagination then leads to the formation of two distinct daughter cells, having one chromatid of each chromosome, therefore becoming genetic copies of the parent cell. Thus, a cascade of reactions leads to the dramatic events of anaphase, and contribute towards making it one of the shortest phases in the cell cycle. Any deficiency in the cellular levels of cohesin lead to improper segregation and difficulties in the alignment of chromosomes on the metaphase plate. This results in aneuploidy, where daughter cells have an irregular number of chromosomes. Centrosome – Organelle found near the nucleus mostly in animal cells, involved with microtubule assembly especially during cell division. Dynamic instability – A property of microtubules where periods of rapid polymerization alternate with dramatic shrinkage events. This is important for their function in the mitotic spindle. Microtubules – Microscopic tubular polymers that are an integral part of the cytoskeleton. Proteasome – A large multi-protein complex that catalyzes the hydrolysis of peptide bonds in specific proteins that are tagged for degradation. 1. During which phase of the cell cycle would non-sister homologous chromatids exchange genetic material? D is correct. Exchange of genetic material between homologous chromosomes only occurs during Prophase I of meiosis. The G1 phase occurs immediately after cell division and is a period of recovery for the cell. During S phase, all the DNA in the cell is duplicated, but without any genetic exchange. On the other hand, during mitotic prophase, the chromosomes condense, but mitosis produces daughter cells that are genetically identical to the parent cell and therefore, no genetic exchange occurs. 2. Where are the two sister chromatids attached to one another? C is correct. The centromere consists of DNA material as well as multi-protein complexes such as the kinetochore and are essential for binding of the chromatids to each other. The centriole and centrosomes are associated with spindle formation and microtubule assembly. 3. What is the structure that binds sister chromatids to the mitotic spindle? A is correct. Kinetochores are the proteins that bind DNA to the mitotic spindle. The spindle is made of microtubules that arise from the centrosome. Each centrosome is made of two centrioles during mitosis. The Anaphase Promoting Complex catalyzes the attachment of ubiquitin to its target proteins, thereby tagging them for destruction by the proteasome.